Expectations the central bank will pause next week on a rate-increasing cycle that started in early 2010 and possibly ease cash availability also helped perk up investor confidence, traders said. Energy major Reliance Industries and software services bellwether Infosys, which together contribute about a fifth to the benchmark index, led the gains. “I think people are expecting the parliament will start working today. That is one thing which might be contributing to it," Neeraj Dewan, director at Quantum Securities, said. 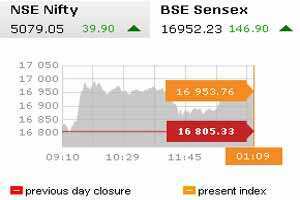 The main 30-share BSE index was up 0.90% at 16,956.54 points by 10:47am, with all but 3 of its components in the green. “The global markets are also quite supportive. Plus everyone is looking towards the euro zone summit. There are high expectations," Dewan said. Asian shares and the euro gained on Wednesday on hopes that the threat of mass credit rating downgrades will pressure European leaders to come up with a convincing framework for resolving the euro zone debt crisis at a crucial summit later this week. A revival in buying by foreign funds over the past week also underpinned the market, Dewan said. Top lender State Bank of India and HDFC Bank gained more than 1% each on hopes the Reserve Bank of India (RBI) will shift its policy stance to support growth from battling inflation when it meets on 16 December. “If there is a pause or a surprise rate cut, that can have another positive impact on the markets," Dewan said. Cairn India rose 1.5% after Vedanta Resources said it was satisfied with the terms for the acquisition of a controlling stake in the energy explorer. The broader 50-share NSE index was trading up 0.90% at 5,084.45 points. In the broader market, there were about 2.3 gainers for every loser with 183.2 million shares changing hands. At 0518 GMT, the MSCI’s measure of Asian markets other than Japan was up 0.94%, Japan’s Nikkei was up 1.13% and South Korea’s Kospi was trading higher by 0.58%. Indiabulls Real Estate plunged as much as 36.45% after the company said it was spinning off its Indiabulls Infrastructure and Power unit into a separate company and shareholders would get 2.95 shares for every share held. Natco Pharma Ltd rose 4.5% to ₹ 253.95 after the company said it would issue shares to qualified institutional buyers with a floor price set at ₹ 215.60 per share. The issue price is usually higher than the floor price. Future Capital Holdings rose as much as 7% after a newspaper report said Deccan Chronicle Holdings was acquiring a controlling stake from Pantaloon Retail in the Future Group’s financial services firm for ₹ 600 to 700 crore. Pantaloon later denied any such transaction "at this stage", and Future Capital shares pared gains to trade up 4%.